SPL Titanium Tension Rods provide for adjustment of front caster, allowing you to change front caster to optimize the turn-in response and to compensate for variances between the left and right caster. Low-friction articulating spherical bearings on our tension rods eliminate the stock mushy rubber bushing to provide a more responsive steering feel. 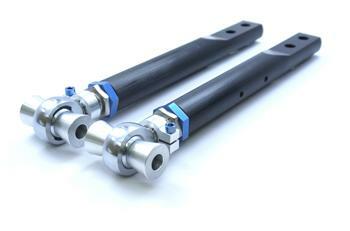 SPL Titanium Series Tension Rods are engineered for maximum performance. Large diameter (1 3/8”) billet T6061 rods are precision CNC machined and gun-drilled to reduce unsprung weight while maintaning high strength and stiffness. SPL’s exclusive 4130 chromoly hybrid adjuster offers wide adjustment range and precise adjustment, and is also CNC gundrilled to reduce weight. Blue anodized titanium hardware shaves even more unsprung weight from the arms, without compromising strength. SPL’s next generation NCT motorsports bearing feature a carbon fiber teflon liner to provide quiet operation, lower friction, smoother articulation and eliminates bushing deflection under load. The injection-molded slot-loaded liner is also self-lubricating and self-cleaning, offering robust reliability for street and track use. SPL Titanium Tension Rods also feature specially machined mounting holes for our SPL brake cooling deflectors, providing an easy way to improve brake cooling for track events and racing.